A “Ticker Symbol” is a unique one to five letter code used by the stock exchanges to identify a company. 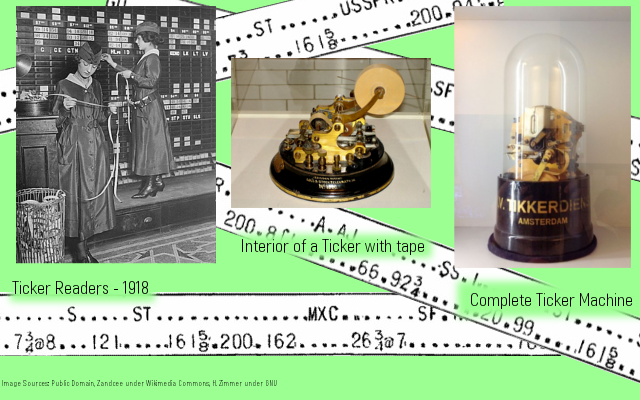 It is called a ticker symbol because the stock quotes used to be printed on a ticker tape machine that looked like the images below. When it printed the stock quotes, it made a tick-tick-tick sound! WARNING: The ticker symbol is NOT just an abbreviation of the company’s name. F is the symbol for Ford. You must have the stock’s ticker symbol in order to place your first trade! It is the only way to make sure you are buying the shares of the company you want–so please make sure you find the correct ticker symbol. Most beginning investors find it confusing to use ticker symbols because before you can begin to do any stock research, you must look up the ticker. And when you do look up tickers, you will often be surprised how many companies there are that have very similar names. Make sure you are buying the stock that you think you are buying. Ticker “COKE” is not the Coca-Cola Company! Wouldn’t it just be easier if we used the company names? HowTheMarketWorks tries to help this with our Smart Trade Drop-Down, where by typing the company name in the trading window, we will give you tickers that match. Click here to try! However, lets take a look at where ticker symbols came from, and why we still use them today. 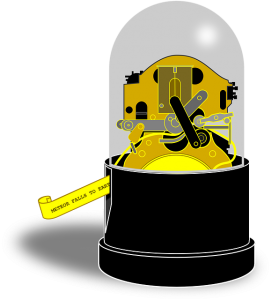 Ticker machines first came into use during the late 1800s as a fast way to move news across far distances; they used telegraph lines to transmit messages electronically. 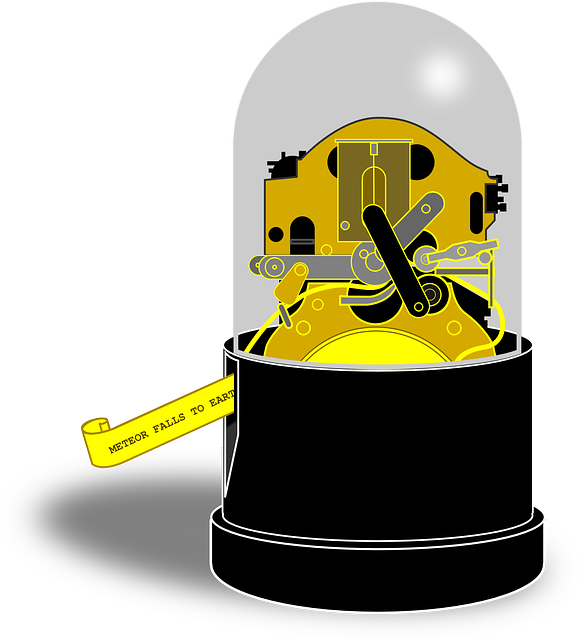 However, with a telegraph machine, each letter of the message had to be spelled out in Morse Code (a series of dots and dashes), read by the operator on the other end, and then typed out onto a message to be actually read by anyone. This was a time-consuming process; the longer the message, the longer it took to write, translate, and read. To speed things up, shorthand writing (the predecessor of today’s “text speak”) was invented. Famously, an old British admiral was the first person to use “OMG” as shorthand in a message to one of his colleagues. For investors looking to get the latest stock prices, this was also a problem. Since there were hundreds of companies being traded and prices being updated every minute, the longer it took to communicate a company’s price meant the whole stream of information was held up. Thus, company names were shortened down to 1-5 characters, and the first ticker symbols were born. Today, the original reason for tickers is still important; computers still take time to process longer names, so shorter codes can be a lot faster when executing billions of trades per day (if you are making trades as fast as you could, it would take almost 5 times as long to write “The Coca-Cola Company” than it would “KO”). There is also another reason why we continue to use tickers: sometimes companies have multiple “types” of stock, or multiple companies have very similar names. For example, Google has stock both under the symbol “GOOG” and “GOOGL“. These stocks are very similar, but they were issued at different times and have different prices, since each share represented a different “slice” of the company. Sometimes you might see a “.A” or “.B” after a ticker symbol–this usually indicates a class A or class B type of shares. Sometimes you might see a ticker ending with a “Q”—this means the company has filed for bankruptcy. Sometimes you might see a “Z” added to the ticker–this means that there is a special situation occurring with the stock. On most financial websites, you will find a QUOTES or GET QUOTES link. When you click on those links, it will take you to a stock quote screen. Usually there is a link on that page that says TICKER SYMBOL LOOKUP or similar. If there is not a ticker symbol lookup link, then try just typing the company name in and some pages will show you related tickers. You can look up any ticker by clicking “Quotes” in the main menu of this page. 1 of 3) What makes up a "Ticker Symbol" in the United States? 2 of 3) Why did investors start using ticker symbols? 3 of 3) Why would a stock have a ".A" at the end of its ticker symbol? D. This would always represent "Preferred Stock"